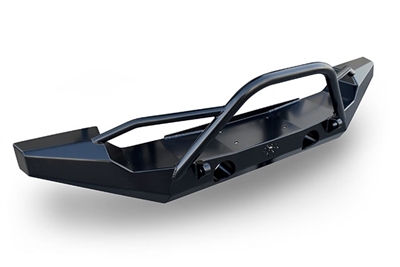 The Brawler™ FULL Width Front Bumper for JK provides the highest ground and tire clearance possible in a full width JK bumper. This bumper brings Poison Spyder form and function to the overlander market, and to those who would like to keep their stock JK fender flares. The bumper extends to the full width of the stock flares, to integrate with them cleanly while protecting them from trail hazards. Like all bumpers in the Brawler product line, the FULL Width is fabricated from 3/16" plate steel, CNC laser-cut and precision brake-formed into a low profile, high clearance design. This product is finished in black with Poison Spyder's proprietary SpyderShell™ Armor Coat process. SpyderShell™ Armor Coat The best-looking, most durable finish coating available from any 4X4 aftermarket products manufacturer. Bought this to match the rear I'd purchased a year back. The bumper fits great and lines up perfectly with the fenders. Power coat from the factory looks great, and I couldn't be happier. Stock fog lamps transferred over with no issues, and all told the install took about an hour. Just need to find a light to go behind that logo in the centre and the look will be complete.